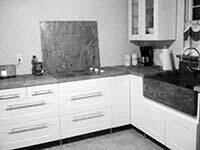 Hello, this is Dino Rachiele, a professional kitchen designer since 1977, an amateur chef, and founder of Rachiele Custom Sinks in 1999. I love copper sinks! Copper sinks are my passion. We build amazing stainless sinks too! You will always work directly with me on your project. You can reach me 7 days a week at 407-880-6903. I am committed to providing you the finest quality copper and stainless sinks in the world along with unparalleled customer service. When you see this anywhere on our site, you can hover over it for more in-depth or important information. Sign up for our monthly newsletter for special discounts and new items. Sign up now. Click here to read over 80 Five Star testimonials on Houzz. 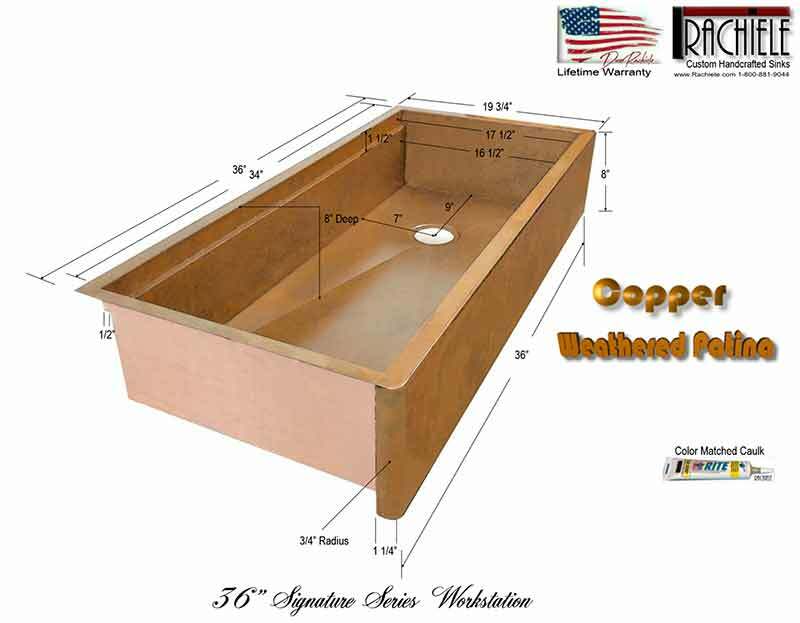 NEW - FREE SHIPPING ON ALL COPPER SINKS UP TO 36"
Please note: No additional discounts or coupons will be honored for items on this page. All items on this page are very close to or under my cost. Thank you. Better Hurry... Limited Quantities and the lowest prices you will ever see! We have quite a few old style Stainless Sponge Caddys. 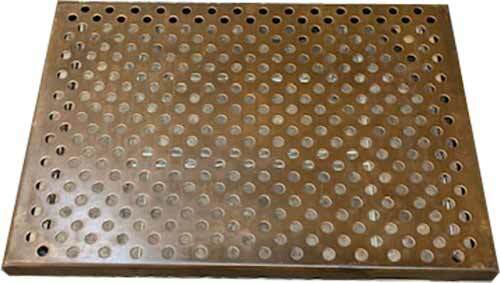 The holes are a different size from what we now produce and they are shorter as well. 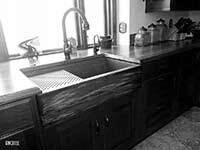 They should fit any of our Signature Series and NexGen sinks unless the sink was a custom front to back width. 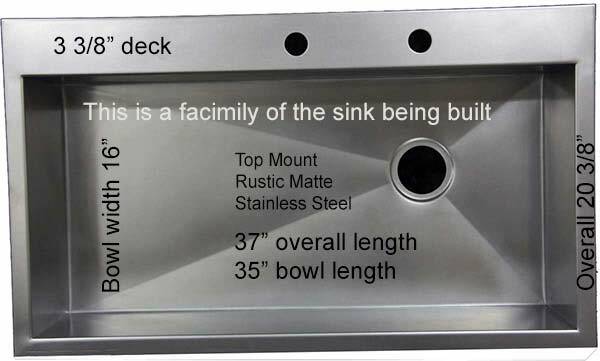 The vast majority of our Signature Series sinks built over the last 4-6 years should allow these to work. If you have any concerns about fitting, please call me at 407-880-6903 These will fit our current sinks too! Copper Grid for bottom of bowl only. Thaw foods faster than any other method! Wash pots and pans and set on the grid to dry. $275.00 $150.00 includes free shipping! We have three grids that measure 17" by 12". They will not fit the ledges of our standard sinks. We have had these for about 5 years and thought it might be nice to offer them to fit the bottom of virtually any of our copper sinks. They will sit lengthwise - meaning 17" right to left, inside the bowl. They normally sell for $275. Offering them for $150 including shipping in the continental US. As you may know, prices of copper fluctuate almost daily. We have a future order of copper coming in and the price is less than we have been paying. Gas prices have gone up, copper went down. 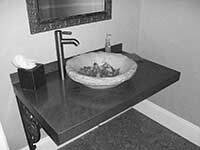 HUGE SALE (this sink only): TAKE 10% OFF USING COUPON CODE DR10. We are using most of this batch to build a large quantity of these sinks; first quality 36" Copper Signature Series Workstation Farm Sink. Your order will come with a butcher grade white poly cutting board, a tube of color matched caulk for installation - Delivered for just $2789! (LESS 10%) Easy care, lifetime warranty. US 14 gauge cold rolled copper, made in the USA by Rachiele. Order online if you can wait. Delivery will be late June to early July. WEATHERED PATINA ONLY (no exceptions). Special Price on 36" Farmhouse Workstation Copper Signature Series Sink with Poly Board and a tube of color matched caulk. $3,391.00 $2,789.00 Free Shipping in the Cont. U.S. WEATHERED PATINA ONLY! About our WHITE POLY CUTTING BOARDS... They are unlike anything you have used before. These are Butcher Grade Boards. They do not get all nasty and discolored. They do not get all cut up and fuzzy. These are designed to last for years. You cannot even purchase this type of material on a retail level. These are truly amazing! I recommend this Disposal - click the image to the left to get one at that price through Amazon. This sink is a first quality under mount Trough Sink - perfect for beverages, filling with ice or other fun kitchen projects. 42" by 14" by 5 1/2" (overall dimensions) ONLY ONE AT THIS PRICE! $2,350.00 $1,399.00 Price reduced for quick sale! Have a question, click here to chat. $3,515.00 Drastically Reduced! $2,200.00 with FREE Shipping in the Continental US. "My Rachiele Copper Sink Story Wow! It looks gorgeous with my marble counters and Italian cabinets. The customer service is outstanding. Yes, I actually talked to Dino--live. Looking over my notes I had forgotten how many copper sinks I had considered before selecting Rachiele. Maybe Dino doesn't want me to mention competitors' sinks, but since they don't compare to his sinks in quality and price, I don't think he'll mind. I had originally selected Native Trails because I saw one in the showroom of the place where I bought my appliances. Then I looked at Brass Elegans, Signature Hardware, Highpoint Collection, Copper Sinks Store and many others. I remember I was very concerned about the color. I did not want a shiny copper-penny color; I wanted a darker bronze shade (color of an old penny). Since I talked to Dino via Live Chat, he sent me a link, while we were talking, to show me the exact color. The color was exactly what I wanted and when my sink arrived, it was exactly the color of the sink in link he had provided. Choosing Rachiele among all the available copper kitchen sinks was easy: it was the only sink that had the drain in the corner. As a person who cooks a lot there is nothing worse than putting your colander in sink with the drain hole in the middle and having all the water back up onto your pasta. 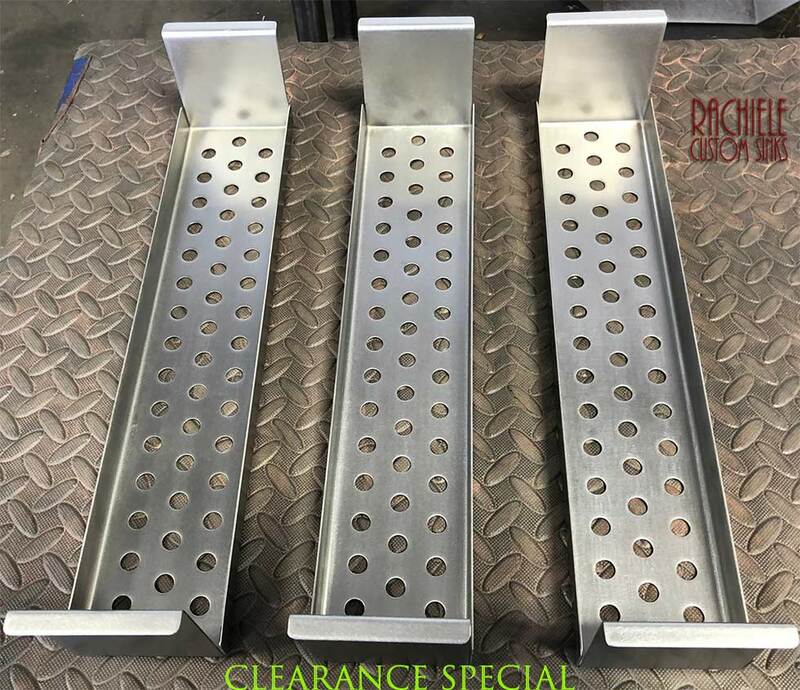 Also if you don't have the drain in the corner, you are almost forced to buy a grate insert to sit on your sink in order to elevate the pans and dishes so the water can drain. I prefer simple, elegant solutions to problems and the corner drain is both simple and elegant and it works. Since I was buying the copper sink for its anti-microbial quality, I wanted to make certain that the copper purity and content was as represented. I felt much more comfortable buying a sink that was manufactured in the U.S. rather than someplace like China where the factories take a lot of shortcuts and don't necessarily follow the specifications they are given, ergo the cheaper prices. Would I buy another sink from Dino? Yes, most definitely. I am going to be remodeling another kitchen and a Rachiele copper sink is at the top of my list for that house." We do not have any other items on clearance at the moment. Check back soon. We add items quite often.